If you are in Melbourne around Christmas time, don’t miss the most popular Christmas event known as Vision Australia’s Carols by Candlelight. 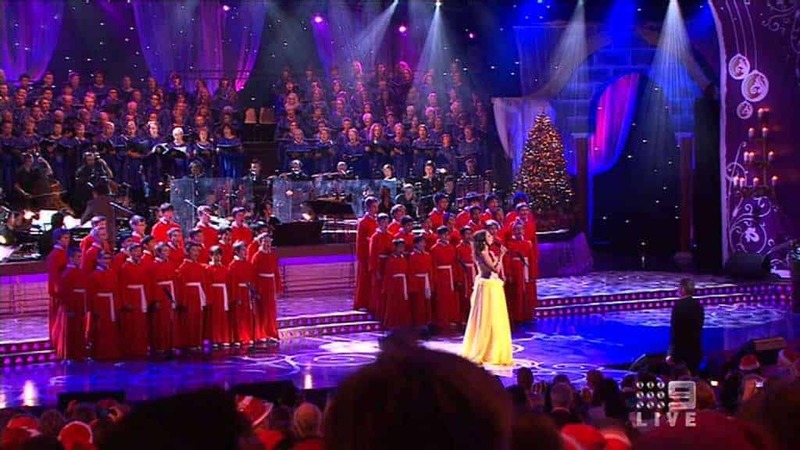 This huge event is a massive Christmas celebration where families come together to sing along to Christmas carols by either attending in person at the Myer Music Bowl or by watching it on TV. The Carols by Candlelight celebrations are held at the Sidney Myer Music Bowl in the Royal Botanic Gardens of Melbourne. This event started way back in 1938 and is by far the biggest Christmas celebration in Australia. This traditional event is held outdoors and involves live music and singing performances of popular Australian artists, famous TV personalities, as well as local choirs. 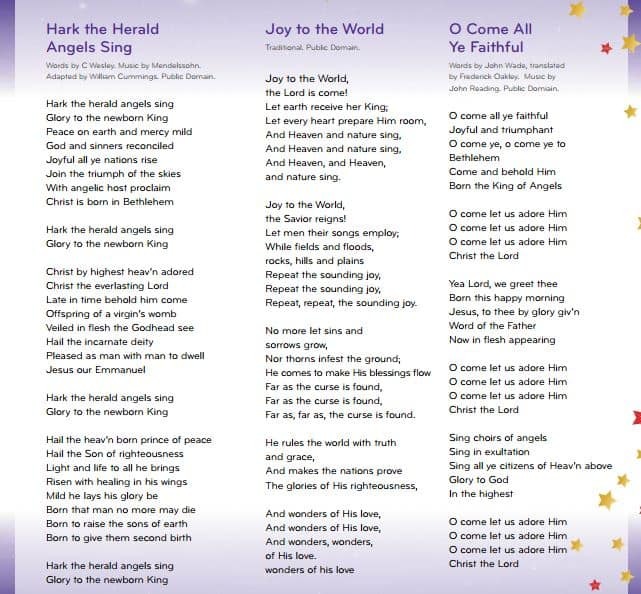 This event is telecast live on TV each year on Christmas Eve, so those who can’t attend in person can enjoy singing along to carols from the comfort of their home. Hosted by David Campbell and Sonia Kruger, performers in the past have included Denis Walter, Dami Im, Marina Prior, Silvie Paladino, Tim Campbell, David Hobson, Anthony Callea, the Jersey Boys, Rob Mills, Beau Woodbridge and Casey Donovan. The carols event in Melbourne also includes a spectacular fireworks display. Thousands flock to the music bowl year after year, where they bring a picnic blanket and a few nibbles, and settle in to listen to traditional Christmas music as the sun goes down. 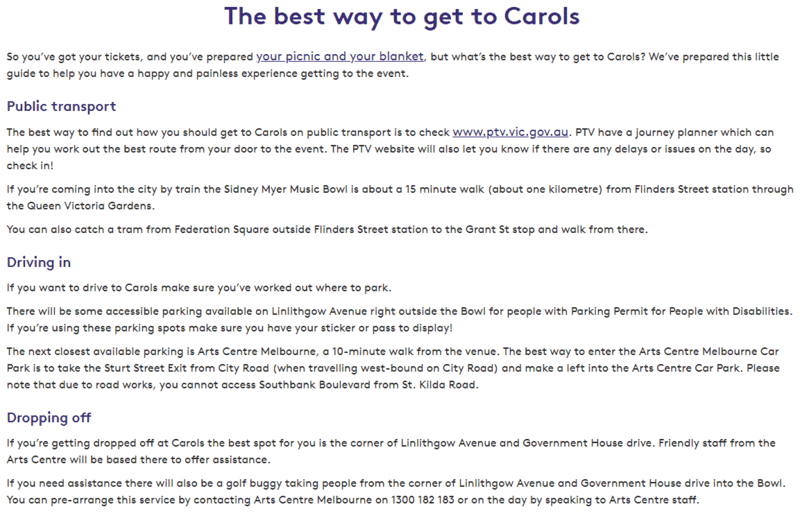 To get to the carols, catch a train and get off at Flinders Street Station. Walk for 10 minutes down Sydney Road, and follow the signs for the Sidney Myer Music Bowl. 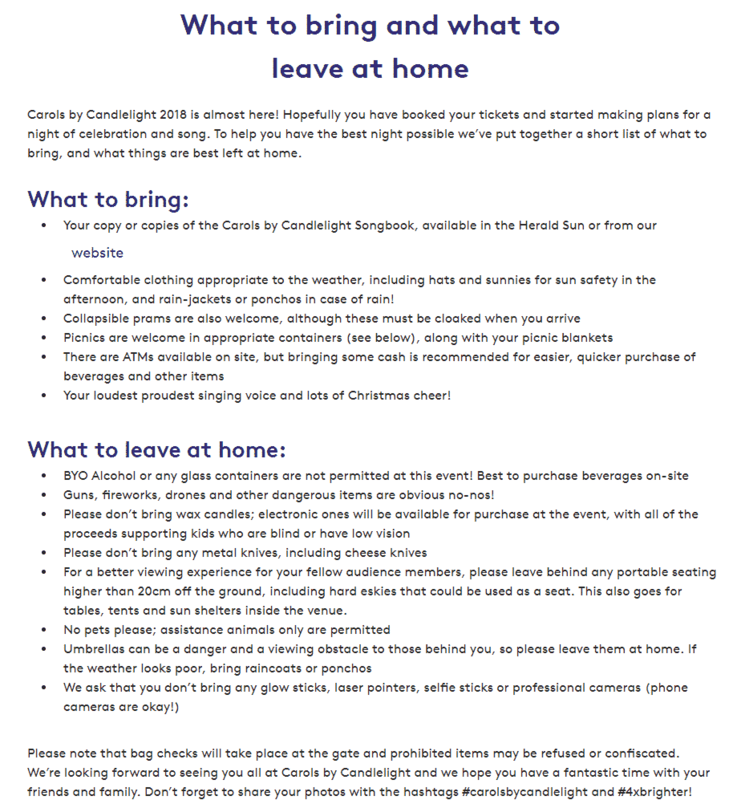 You can bring the following items into the event: rugs, cushions, picnics, collapsible prams and sealed or empty plastic water bottles up to 650mls. Lawn chairs are permitted providing they are not more than 20cm off the ground. Alcohol is not permitted, nor are high backed chairs – this is to ensure that you don’t block other carollers sitting behind you on the lawn. 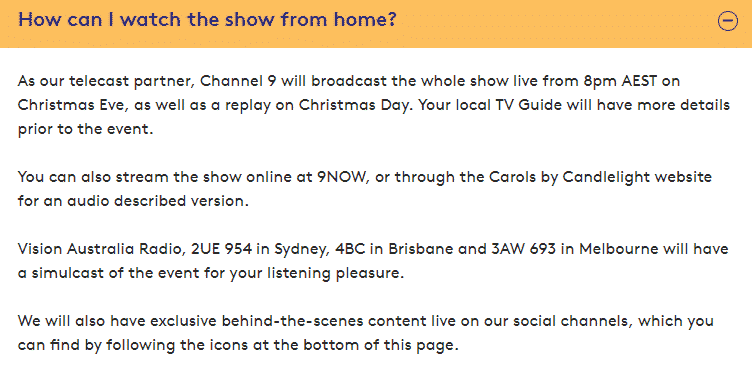 Carols by Candlelight will be televised on Channel 9 from 8pm, or you can listen to the carols on Vision Australia Radio, 2UE 954 in Sydney, 4BC in Brisbane and 3AW 693 in Melbourne. 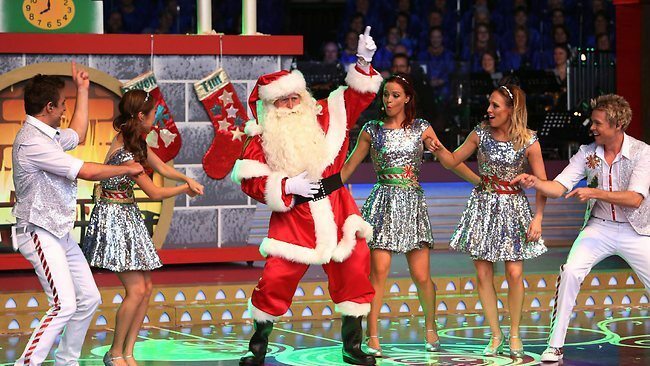 The Carols by Candlelight Rehearsal night will be held on 23 December. Gates open at 2.00pm with performances commencing around 3.30pm. What time does the rehearsal night start and end? 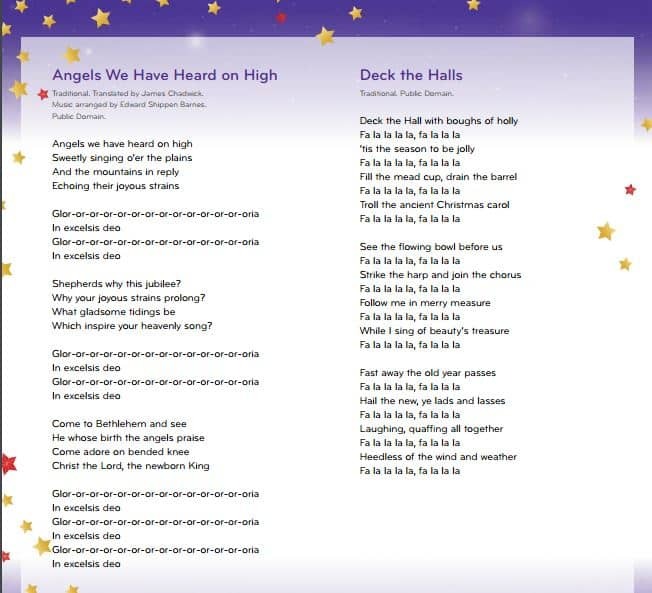 The Carols by Candlelight Rehearsal Night starts at 3.30pm and finishes at around 10.30pm. Is there reserved seating for the rehearsal night? Or is it all general admission? The seating for the Carols by Candlelight Rehearsal Night is general admission only. What time does the Rehearsal night run from? 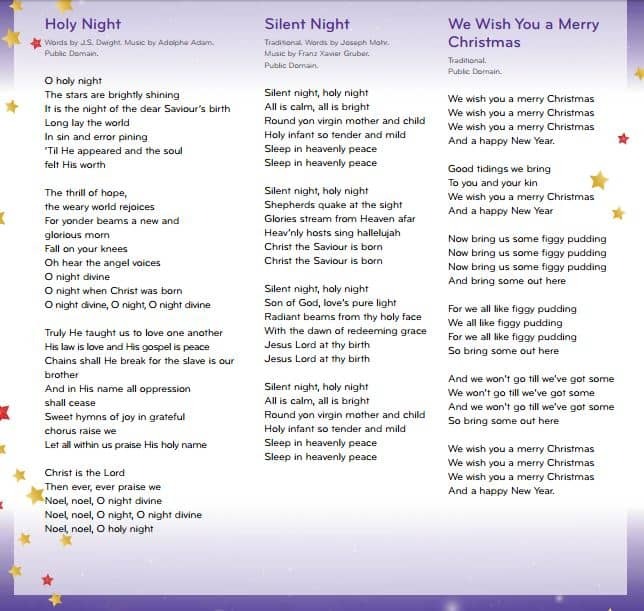 The Carols by Candlelight Rehearsal night starts from 3.30pm. I have booked tickets for the rehearsal but couldn’t find a section for tickets for children? 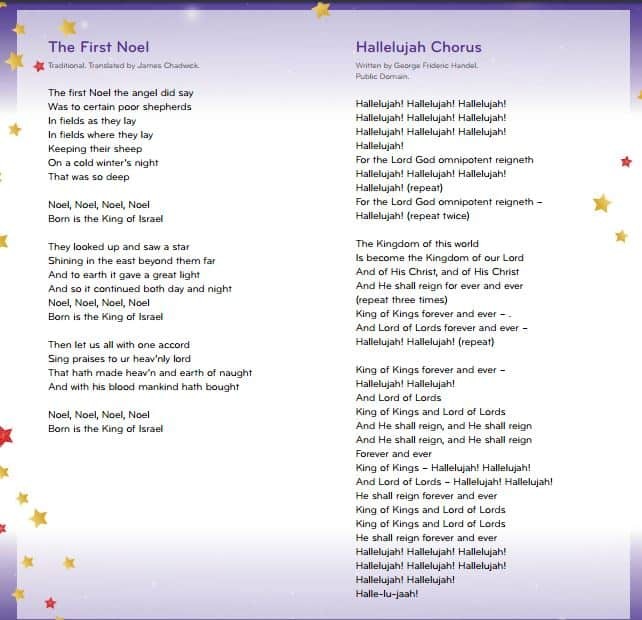 Children’s tickets for the Carols by Candelight Rehearsal night fall under the “Concession” category. Have a great time at the Carols! Just wondering when we can purchase tickets for the rehearsal night on the 23rd Dec 2016 as I can’t find where to purchase them please. I have been advised by Vision Australia that tickets will be on sale in early December. The Christmas Eve Carols tickets are being sold through Ticketmaster, so I would assume the same for the rehearsal show. I can’t make it on 24th but have heard you can see the rehearsal. Do you know how to source rehearsal tickets? I am interested in purchasing tickets for the rehearsal night on the 23rd December 2016 but i can’t seem to find tickets as yet. Do you know when they go on sale? There is no information from Vision Australia as yet about the rehearsal event. However in previous years, tickets have gone on sale in early December through Ticketmaster. Previous years there has been an act for the young children to enjoy, such as Hi 5. Will there be an act (or a couple of acts) for young children? Yes, there will be entertainment for kids as there is every year. We are still waiting for Vision Australia to announce the performers for 2016, however you will definitely get a visit from Santa as well as a number of children’s performers who open the show every year. The televised show starts at 8.30pm, howeve the children’s performers are usually entertaining kids from around 5.30pm. I will update our page when the performers are announced and I note that tickets will go on sale on the 15th of September through Ticketmaster. Roughly what time would this event finish please? The estimated finishing time is around 11pm. Hi. Just wondering if there’s a family price for the A-Reserve seating. We are actually a family of five. With thanks. Child and family passes are not available for A-Reserve seats but note that children under three seated on an adult knee are admitted free. Family tickets are available for lawn seating for $160 (2Ad + 2Ch) and an extra child will cost $40. I am unable to find any current information online as Vision Australia hasn’t updated their website for 2016. However, in previous years, gates opened at around 3pm and ticket prices were around $20 for adults. Unfortunately, I don’t have a list of performers as they will be released later in 2016. Check back with us and I will update the page once further info is released. 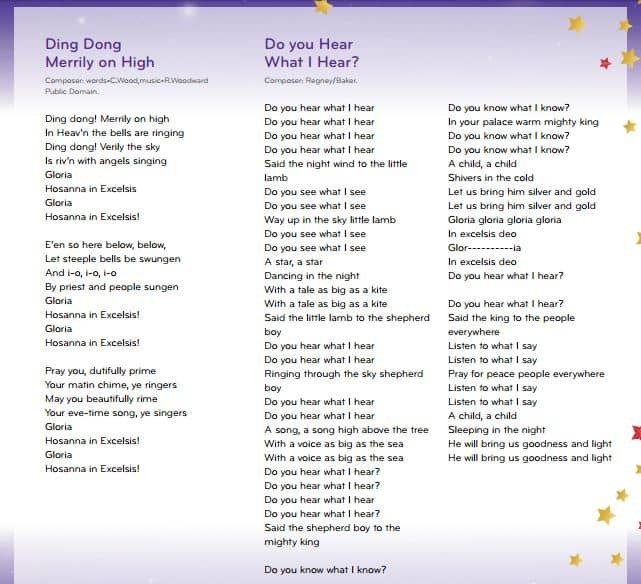 I cannot find any current information as yet for 2016, but I have been to many Carols by Candlelight shows in the past and there has not been any Auslan interpreter on the stage, nor do they have captions on the screen. Captioning is available on all digital channels which may be the best way to enjoy this fabulous event with your family. Just wondering if it’s fine to take babies under 2 into the A Reserve seating obviously the would be sharing a seat but we would like a seat not sitting on the lawn area preferably. Reserve seating is perfectly fine for children of all ages. This is a family friendly event, and kids are welcome in all areas. 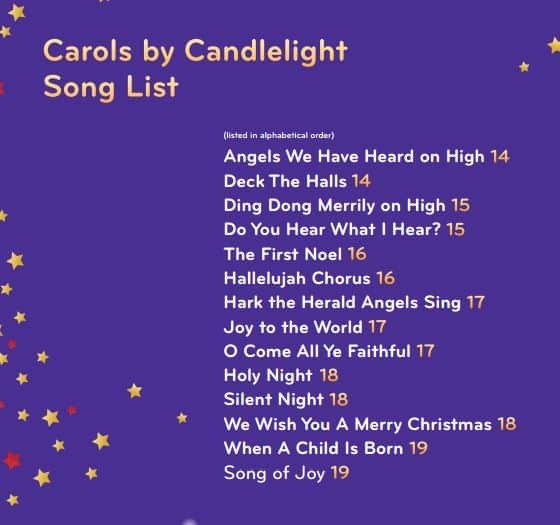 Most kids will fall asleep after the children’s performers in any event, so hopefully you will be able to enjoy a peaceful Carols by Candlelight with your little one asleep on your lap! Have a great time at the 2016 Carols! Just wondering when tickets go on sale for 2016? In previous years, tickets have gone on sale in around the 2nd week of October. Check back with us and we will update our page once tickets are released. What is the lawn seating like? Can you see the stage? The simple answer is yes, you can see the stage from the lawn area. 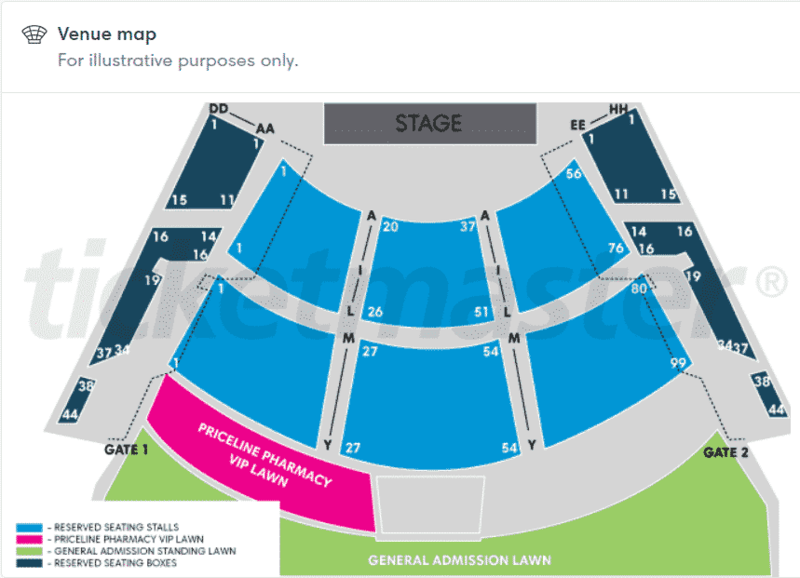 All of the lawn area is “general admission” so the earlier you get to the Myer Music Bowl, the closer you will get. The lawn is graded gently from front to back, so gives a ‘stadium seating’ effect. High chairs are not permitted, so you wont have your view blocked by other concert-goers. I have been to the Carols many times, have only ever purchased lawn seating and have always been able to see the stage. Like any concert, the performers may be small, but the sound is amazing! I hope you enjoy Carols by Candlelight!